Safina means “boat” in Arabic. 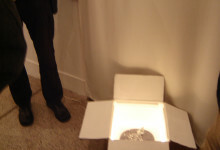 This artwork is presented as a cardboard box, painted white inside and left unpainted outside. When closed, the box looks like a regular shipping box. At the bottom of the box is a cardboard square that is slightly elevated. A kind of dark circle is drawn on it and a boat made of reflective paper is place on top. This small boat, facing Mecca, pulls silver strings behind it, with ninety-nine small aluminum balls attached to the strings. A yellow light spreads from the crack between the bottom of the box and the cardboard square.